Although we are a triathlon team our individual interests vary and we have team members that participate in cyclocross, long distance running relay races, and adventure racing. Here’s a little info to see if we can’t pique your interest to join along. Races typically take place in the fall or winter and consist of multiple laps of a short 1.5-2 mile course. The courses vary in terrain throughout featuring pavement, wooded trails, grass, steep hills and obstacles requiring the rider to quickly dismount, carry the bike while navigating the obstruction and remount. Here are some links to get you started in this crazy, fun sport! 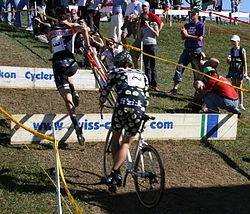 Cyclocross Magazine is a wonderful resource for all things cyclocross. A beginner’s quick guide is a funny, well written article that really tells you “how it’s gonna go”. Plus a great video at the end…shows all the action of a race!! These long distance running relays offer a unique challenge as they cover roughly 200 miles in about 24 hours. They test your stamina, both physically and mentally. What a rush to run in the middle of the night with a headlamp!! Here are two popular races here in New England. Adventure racing is a combination of two or more endurance disciplines, including orienteering (if an orienteering map is used) and/or navigation (when non-orienteering maps are used), cross-country running, mountain biking, paddling, climbing and related rope skills. An expedition event can span ten days or more, while sprints can be completed in a matter of hours. There is typically no down-time during races, irrespective of length; competitors must choose if or when to rest. There is an additional factor of adventure racing – teamwork. Unlike triathlons where we may be members of a larger team, but we are racing for ourselves, adventure racing requires teammates to work together in adverse conditions to succeed. Untamed New England Adventure Race is a roughly 200-mile race taking approximately 4 days, consisting of mountain biking, canoeing, kayaking, trail running, orienteering and rope work. The race is not a relay, you work as a team, non-stop in groups of 2, 3 or 4-people. The main division for prize purposes is 4-person. New York Adventure Racing Association serves racing athletes in the northeastern U.S. through races, training events and clinics. Genesis Adventures is a company that runs all types of athletic events, including adventure races. These are held mostly in the state of NY. Odyssey Adventure Racing is another great adventure racing company; most of their events are in the VA/WV areas. Adventure 360 provides an outdoor adventure experience in the state of AZ. Adventure Racing doesn’t always have to involve overnights….they can be fun obstacle courses too! Check out these great local races to get your juices flowing! Rugged Maniac 5k is a 5k course with at least 15 obstacles, including things like climbing a 7 ft wall and crawling through mud under barbed wire! Columbia Muddy Buddy is a ride-and-run series done with a partner, a bike and a 6-7 mile off-road course…plus obstacles. Too much fun! !